This file seeks to provide some reliable and as comprehensive as possible information about Bermuda specifically for the disabled, so they can have a good idea, as visitors or newcomers, of what to expect - and what not to expect. Bermuda is certainly a lovely place for all able-bodied residents and visitors, but for the physically challenged/disabled, access for the disabled/physically handicapped and/or mobility-impaired is very limited. Bermuda, a tiny (only 21 square miles) British Overseas Territory island 900 miles due east of the nearest mainland, North Carolina, USA, is similar to all the still British or once-British Caribbean islands 900 miles to the south in having very few facilities and services specifically for the learning or physically disabled or blind or deaf. There is no equivalent in Bermuda of the USA's Americans with Disabilities Act (ADA) or the UK's Equality and Human Rights Commission at http://www.equalityhumanrights.com/). Bermuda has no legislation protecting the rights of the disabled, beyond is contained in the local Human Rights Acts, unlike the USA, UK, Canada, etc, all of which do, as shown for some in the web-links above. The Bermuda Government does not require accommodation providers - hotels, guest houses, cottage colonies, apartments, villas etc - or shops or restaurants or sightseeing attractions or boats to make any of their facilities accessible. (Some try in certain ways, voluntarily). Some hotels have tried to create disabled-friendly (but not always ADA-compliant) guest rooms. In contrast, the USA, Canada, UK, Europe, Australia, New Zealand, etc. have laws that require this. 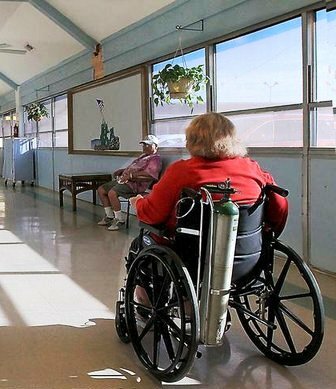 Unlike in the USA, Canada and UK, Bermuda exerts no requirement on business owners, landlords, owner occupiers and tenants to make adjustments to the physical features of properties to accommodate disabled persons - in or out of a wheelchair. Shops, stores, private sector offices, government offices and historic buildings are not required to - and mostly do not - offer access to all floors to the disabled in a wheelchair. Nor do they have front doors which open in a disabled-friendly way. Many places are not accessible at all. Bermuda is not wheelchair-friendly. But in the City of Hamilton, some roads have disabled-friendly sidewalks. Bermuda's Sidewalks are often very busy with pedestrians, can be steep, are not always on both sides of the road and traffic on the main road between sidewalks is often dense. It is a very hilly, with few flat places, not good for disabled people confined to a wheelchair who are not accompanied by a spouse or caregiver with the strength to lift them. Main roads are very narrow and almost always busy during the weekday especially. There are now sidewalks with sloping ramps uniformly throughout the most frequently traveled tourism and international business areas of the City of Hamilton. The Town of St. George is improving in this area. But outside the city and town you will not see many sidewalks elsewhere evenly on one side of the road or another - and they don't have ramps. With so few roads in Bermuda with little traffic, persons in wheelchairs and the ambulatory disabled - persons who can walk but have a balance or mobility problem and may have to use a cane or crutches or walker - should be exceedingly careful when crossing a street and in the city or town should do so only when there is a traffic light and a push-button pedestrian crossing with a "walk" and "don't walk" signal; and when using stairs, stair cases, steps. The Bermuda Government's Department of Planning has no equivalent of the Access Statement of Planning Departments in London and elsewhere in the UK, or the USA's ADA. There is no requirement in Bermuda to show how the principles of inclusive design, including the specific needs of the disabled, are integrated into the proposed development and how inclusion will be maintained and managed. New permanently disabled non-Bermudian resident newcomers to Bermuda do not get any of the financial assistance from the Bermuda Government routinely offered by Canada, USA, UK, etc. to their citizens and legal residents including newcomers. The severely disabled of Bermuda of any age do not get - as they do in the UK, etc. all their medical prescriptions free of charge. Although Bermuda is (nominally) British, it offers none of the benefits British-UK disabled citizens get, such as a non-means-tested government-paid Disability Allowance (DLA) in the Higher Rate for mobility, or Middle Rate or Lower Rate, or if over 65, an Attendance Allowance, for those who need help with personal care, by day and night. Plus, in the UK, a spouse or relative or friend under the age of 65 who provides at least 35 hours a week of care to a severely disabled person is entitled to a government-paid Carer's (Caregiver in USA and Canada) Allowance. Rentals of cars or trucks are not permitted. No disabled visitor can rent a private car or truck. Guide Dogs for the Blind. Cruise visitors who are blind, have their own guide dogs and want to go ashore with the dogs are advised to get their caregivers or family members who are not blind to apply as long as possible in advance, as all animals including guide dogs for newcomers and tourists must be approved. A formal application must be made in advance to the Ministry of Environmental Protection. See ApplicationForPermitToImportSmallAnimals.pdf. Personal mobility vehicles. Not allowed on any public roads in Bermuda by persons who are not residents and not licensed and insured in Bermuda to use them, unlike in St. Thomas, St, Croix, San Juan, etc (American territories where US laws including ADA apply). Public Transport, buses and ferries. See separate headings below. Taxis and costs. See under Taxis in Getting Around in Bermuda. Same fares apply to disabled and able. Some taxis can take the physically handicapped and other disabled. Before they arrive in Bermuda by air any severely disabled or walking but mobility-restricted visitors who have made and paid or reserved hotel or guest house or apartment reservations should ask that provider to contact one of the taxi services and make a taxi reservation stating their disability-related taxi needs. Similarly, those who arrive on a cruise ship should ask their cruise ship provider for the same service. Taxis are great for picking up people from and taking them back to airports and taking their passengers from place to place on fairly short trips. For the disabled who cannot use a moped or scooter or board the buses, they offer a good but expensive - way of sightseeing further afield. But for most visitors they are not the most economical way to see the island when compared to the much lower costs of public transportation. Presently no Bermuda laws require any type of public or private transport to take the disabled, unlike in UK, USA, Canada, Europe, Australia, New Zealand, etc. If you are sensitive to or may have any disability-related or other emergency, a major factor may be to have a non-disabled driver available, one who is fit, mobile and agile enough to render physical assistance such as pushing a manual wheelchair if necessary in the event (no matter how remote) of an accident or medical or any other emergency, especially when time may be of the essence in say arriving in time for an airline or cruise ship departure or fulfilling a time-specific rendezvous or getting prompt medical attention. This could be a life-saver. UK's Cinema Exhibitors Association Card that gives free cinema (movie) tickets to carers (caregivers) who accompany qualified disabled individuals who apply for the card. UK's Holidays All Consortium or Tourism for All or Holiday Care Service organizations for the disabled. UK's government-approved and supported Motability Car Scheme for the disabled which enables those qualified to swap their Disability Living Allowance at Higher Rate or equivalent by going to a Motability-recognized car dealership and order a car plus maintenance plus insurance, every three years. Unlike in Canada & USA where vans and mini-vans for owners or co-owners in wheelchairs can qualify for a rebate of up to US$1,000 directly from General Motors, Ford, etc. no rebates apply to those who are Bermuda-based. Airlines serving Bermuda from the USA or Canada or UK don't ask or require the Bermuda Government to comply with any of their or their host-nation's disability-related requirements. Bermuda presently has no gently sloping jetways (but they are included in plans for a new airport). Disabled incoming and outgoing passengers unable to use aircraft steps will need to be hoisted to an aircraft front right hand door. If appropriate, request an onboard wheelchair be provided or if a seat is needed with a moveable armrest, or both. Verify that the aircraft configuration allows for washroom use via an aisle-navigable wheelchair. You may need extra space to store a walker or crutches. If you bring a wheelchair for use here - recommended - arrange in advance to have it checked as priority baggage. 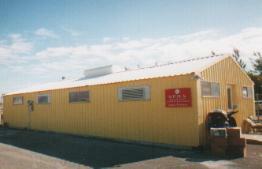 This small airport is owned and operated by the Bermuda Government. It is nice but has no jetways. Airlines should ask the Bermuda International Airport to make the airport hoist available when required and to be asked for other assistance. A disabled passenger transporter is here. The airport can take departing USA-bound passengers in wheelchairs from the departure lounge to ground level. There is an elevator. There are two Handicapped Parking spaces in the Short Term car park. 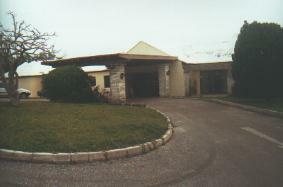 Bermuda Physically Handicapped Association headquarters. Unlike in The United Kingdom and Canada, they are not NKS or equivalent key-accessible toilets and the unit at KEMH is often used by the non-disabled in violation of the needs of the disabled. Bermuda has some absolutely gorgeous private and public beaches, ideal for enjoyment by the fit and able. But none of them presently offer the disabled any of the wheelchair-friendly vehicles shown below. The level of demand and economies of scale have not yet been sufficient to justify the expense.. Disabled visitors should not attempt on their own to use their wheelchairs to get down to a beach. They should ensure a caregiver accompanies them. Also, because public transport buses cannot carry wheelchairs at this time, disabled visitors and their caregivers who want to visit most beaches not near where their cruise ship has docked must do so by taxi. This Bermuda Government-owned facility has no Disabled Parking sign outside. There is a ramp to the entrance. Every January to February, for 2 hours a night, mostly at City Hall in City of Hamilton accessible via a curving outdoor ramp that now leads to the City Hall Theatre. There are special places for the wheelchair-bound and a seat nearby for a caregiver. Regular prices apply. Ageing and Disability Services Office. Until September 2015 the National Office for Seniors and the Physically Challenged (NOSPC). Continental Building, on the corner of Church Street and Cedar Avenue, Hamilton. Or by Airmail at P. O. Box HM 1195, Hamilton HM EX, Bermuda. Open 8:45 am to 5 pm Monday-Friday. Phone (441) 292-7802. Fax (441) 292-7681. Under the remit of the Ministry of Health. As in the UK, there is no national register of senior citizens/ disabled/physically handicapped persons. The new name of the office aims to reflect its expanded remit to provide services to people with disabilities rather than those with physical challenges only, while replacing seniors with “ageing” to be consistent with the Bermuda Government’s plan to promote such initiatives as the National Ageing Plan. The service provides a variety of different functions including regulation and compliance, coordinating services and promoting awareness. It will provide oversight of the integrated production and functional skills programmes at the K Margaret Carter Centre, formerly The Opportunity Workshop and The Orange Valley Centre, and provide advice and guidance on best practices for accessibility to both public and private sectors, among other services. In May 2010 NOSPC was tasked with exploring options for employment tax relief for companies that hire disabled people. In January 2010 a Para transit Strategy and Business Plan was proposed. It involved a meeting between taxi operators who service the mobility impaired and the Ministry of Tourism. The purpose was to seek taxi operators' views. The goal was to establish a Para transit service to provide transportation to Bermuda's mobility impaired population. It was hoped the plan will establish a framework for a transit system customized to suit the needs of Bermuda's physically impaired and possibly their equivalents who are tourists. On June 18, 2007 a National Policy on Disabilities was applauded by members of Parliament, but has yet to be implemented. Then-Minister of Community and Cultural Affairs, Wayne Perinchief, presented the National Policy to the House of Assembly to cross-party support. It aimed “to ensure that disabled persons have every opportunity to reach their individual potential and to see the removal of barriers that prevent their full participation in Bermudian society”. Mr. Perinchief classed a disability as a long-term health condition lasting more than six months, which can include physical, emotional or learning difficulties. According to the 2000 Census, disability affects 3,000 residents on the Island — five percent of the population. Almost a quarter — 23 percent — of 16 to 64-year-olds reported back or spine problems, while 33 percent of seniors suffered from arthritis. Among 200 people with a learning disability, 118 were cared for by relatives — many of whom were over 60-years-old. Mr. Perinchief said: “These statistics speak volumes about the magnitude and impact of disability on people in our community — from disabled persons themselves, to their friends, family and support networks.” He said the National Policy was the result of action by then Minister of Health and Family Services Patrice Minors, who appointed a Committee to address the issue in January 2005. The committee was formed to develop a National Policy, by setting down guiding principles; objectives in access, housing, health, education, transport, communication and training; overall goals and objectives. Technical officers from the National Office for Seniors and the Physically Challenged assisted in drafting policy, and the team reviewed legislation not only from Bermuda, but from other countries around the world. There is now a Committee for a National Policy on Disabilities. In 2005 a National Advisory Council on Disabilities was established, after the Committee for a National Policy on Disabilities met in 2005 to determine guiding principles; recommend policy objectives in the areas of access, communication, education, training, health, housing and transportation; and to identify overall goals and objectives for each area. Its report was completed and Government accepted the recommendations with the 155 objectives. Bermuda National Library. Accessible by elevator. There is one Handicapped Parking place between it and the Bermuda Historical Society. Free access. Bermuda Police Service. Its mission statement is "To ensure a safe, secure and peaceful Bermuda for all, because we care..." But it does not extend to helping disabled persons with Disabled Parking Badges ensure the latter are not abused. On a number of occasions when this has happened, disabled members have called the police in vain. Human Rights Commission. Suite 304, Mechanics Building, 12 Church Street, Hamilton HM 11. Telephone 295-5889. Or e-mail hrcbda@ibl.bm. Human Rights Act 1981 and Human Rights Amendment Act 2000 gives the disabled in Bermuda some rights in theory but in practice, based on complaints from some disabled, have been shown to have no teeth. Under the Bermuda Human Rights Act 1981 and Human Rights Amendment Act 2000, a disabled person is one who is registered with any degree of physical disability, infirmity, malformation or disfigurement caused by bodily injury, birth defect or illness, including diabetes, epilepsy, acquired immune deficiency syndrome, human immunodeficiency virus, paralysis, amputation, lack of physical coordination, blindness or visual impairment, deafness or hearing impediment, muteness or speech impediment, or physical reliance on a guide dog, wheelchair or other remedial appliance or device. There are some very serious deficiencies compared to other countries. For example, in the USA, Canada, UK, European Community, etc. a disabled person is one with a physical or mental impairment which has a substantial and long term or permanent adverse affect on his or her ability to carry out normal day-to-day activities. The latter Acts distinguish disability from short term illness and injury and accentuate that it is the extent of the impairment, not the extent of the handicap, that is important. But not in Bermuda. Transport Control Department. 11 North Street, Hamilton HM 17, telephone (441) 292-1271, the equivalent to the Department of Motor Vehicles (DMV). There is a "PC" license number for a minivan that can carry a wheelchair-bound passenger. At Par-la-Ville. Telephone (441) 295-2487. Weekdays only - not lunch times. On Queen Street a few blocks from the various cruise ship docks. There is a single Handicapped Parking area outside. Also visit Par-la-Ville Park immediately behind, recently made much more accessible for the disabled. E-mail palmetto@ibl.bm. The largest private property owner. Ask which museums, houses and services are accessible. None have a Handicapped Parking by Permit Only sign. There is a fee for each place unless visitors are current members of a reciprocal National Trust abroad and bring their current membership cards. Bermuda Government's Public Transportation Board at 26 Palmetto Road, Devonshire DV 05. P.O. Box HM 443, Hamilton HM BX, Bermuda. Telephone (441) 292-3851, or fax (441) 292-9996 or email info@ptb.bm. See under Buses in Getting Around in Bermuda. Disabled passengers normally expect, wherever they go in the world, to use public transport. This is not the case in Bermuda. Buses are fine for able passengers but are not equipped for the severely disabled who needs to use a wheelchair on the buses, or the walking mobility-restricted disabled who use sticks or crutches who are unable to stand when the buses are crowded as they often are, especially at rush hour times or on busy tourism routes. Nor can the buses carry any portable (fold-up) wheelchairs as they don't have any spaces designated for luggage or bulky items. 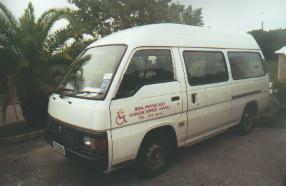 In 1993, a task force that developed the Headway Report made recommendations as to how the Bermuda Government could introduce public transportation for the handicapped. Since that time there have been numerous attempts to address the issue but no meaningful outcome. In 2009, a task force was spearheaded by the Ministry of Community and Cultural Affairs but to this day public transportation by bus is still not possible for the handicapped in wheelchairs. Nor will they be until/if land is ever purchased to make the buses internationally accessible to wheelchair users. Thus on Bermuda buses (but remedied on buses in the USA, Canada and UK) there no signs pointing to seats reserved for clearly elderly and mobility-reduced passengers. In the USA, Canada, UK, Australia, all European cities, there is a legal requirement that buses must carry at least one wheelchair-bound passenger and carry signs pointing to other priority seating for elderly and/or mobilty-impaired passengers such as those needing crutches or walking sticks. In the UK, in January 2017, this was announced, see https://www.equalityhumanrights.com/en/our-work/news/wheelchair-spaces-buses-must-be-priority-court-rules. For disabled newcomers or visitors, the good news is that Bermuda has a fast, frequent (daytime) handicapped-accessible Bermuda Government operated public transport ferry service that, on some ferries on the major routes, can carry those confined to push-wheelchair and electric wheelchairs and their caregivers. For them in particular, it is by far the best and least expensive getting-about option during their Bermuda visit. It enables them to see and enjoy Bermuda's best features, her glorious seascapes. They offer lower deck covered seating for the disabled and their caregivers (carers). They can get around quite easily and not expensively via these ferries to the principal sightseeing attractions of the City of Hamilton in the middle of the island, Dockyard (see Ireland Island north, above) and its Somerset Parish environs to the west and Town of St. George to the east. But note this service is available only when the weather, wind and sea conditions permit and they don't go to any of the island's beaches or other attractions. See http://www.marineandports.bm then check current (applicable 2017 Ferry Schedule. For these schedules, be prepared to wait for a few minutes of apparent no activity, after which the details will appear suddenly. The Paget to Warwick ferry will take the walking disabled. Ferry stops in Paget, Warwick and Watford Bridge have flights of steps or other impediments that prevent the unaccompanied or accompanied in a wheelchair from accessing the service at all; and should also be approached with caution by others who are ambulatory but have mobility or balance problems. Bermuda Red Cross, Charleswood, 9 Berry Hill Road, Paget Parish. Direct telephone number is (441) 236-8277. Or via airmail at postal address P. O. Box 772, Hamilton HM CX, Bermuda. Rent a wheelchair (but not a motorized one, they are not available locally except to local residents who have appropriate local licensing and insurance to travel on Bermuda's roads) or walker/zimmer frame if you don't bring one. For the disabled who can ride horses with assistance. The facility's equestrian services are closed for July and August as it is too hot for horses and humans. An appropriate contribution will be expected if you give notice you wish to use the facilities. From here, a team represents Bermuda at the Paralympics. The Bermuda team became part of the Olympic movement at the invitation of the British Riding for Disabled Association in the United Kingdom. City Hall, City Hall Theatre, Art Galleries and Bermuda National Gallery have nice facilities accessible via the curved disabled access outside, then via an elevator. City Hall also offers at least 9 Handicapped Parking by Permit Only places and has done more for the disabled in Bermuda than all other organizations combined. Other facilities in the city that are wheelchair accessible include pedestrian crossings flush with pavements or sidewalks; the two biggest banks, with ATM cash machines low enough; and St. Andrew's Presbyterian Church on Church and Court Streets. Access to all floors of the City Hall is possible by those in wheelchairs via an elevator. Cruise ships can materially help improve Bermuda Disability concerns, but have not acted. Interestingly, many cruise ship companies serving Bermuda from the USA and UK in particular have companies or corporations registered in Bermuda. When disabled cruise ship visitors are allowed by their cruise ship to bring mobility scooters for use on the cruise ship, note they cannot be used on Bermuda's public roads. See this extract of a July 24, 2013 email from a disabled resident of Pittsburgh PA: "It is disappointing you don't yet have and regrettably are not likely to get any Bermuda laws similar to those in the USA specifically for the disabled and handicapped. But there is something the cruise ship lines can do, especially Norwegian Cruise Line (NCL), owner of the Breakaway. I understand Its corporations are Bermuda-registered, so it has a greater reason and far more international clout than we as disabled individuals do to press the Bermuda Government to pass meaningful laws to bring services for the disabled up to international par. I recommend that before family members who include a disabled traveler go ahead and pay a high cruise price for a Norwegian Breakaway cruise to Bermuda, they should contact NCL directly instead of dealing with a travel agent. They should tell NCL they know its home port, New York, and all other US ports are required to have full compliance with American disability laws. They should expect NCL to confirm that when it accepts passengers with disabilities on its cruises, it requires governments of all places where it sails including Bermuda to enact similar disabled-friendly laws, so that its disabled passengers get equal value for money instead of being disadvantaged in public transport and other ways." Disabled cabins on board with adequate door width for wheelchair access. Is the furniture lowered? Do their bathrooms have grab rails? Are the toilet seats raised? Are there shower stools? Wheelchair or scooter rental on board (generally, no). Or can you take your own wheelchair or scooter and if so can the latter also be used in Bermuda? Guide dogs allowed on board? Be aware they need special permission before they can disembark. See Guide Dogs for the Blind and Disabled, below. Hoists available on board? If so, where? If not, you may have to take one, if allowed. Those sailing from US ports to Bermuda are required by US laws have between 15 and 25 disabled cabins and staterooms, more roomy than for the non-disabled. But be aware of the fact that some cruise lines and their travel agents don't check to see that people really are disabled - wheelchair confined, blind, deaf or ambulatory with a stick - and are registered as such with their state or provincial government agencies, they allow persons who are not disabled to occupy staterooms intended solely for the disabled and their caregivers or carers. Disabled persons, if denied a cabin specifically for the disabled, under American laws have specific legal remedies if such cabins are instead given by cruise ship operators to persons not officially registered as disabled and don't have appropriate ID documentation to prove it. Cruise ships arriving in Bermuda with blind other otherwise disabled passengers with their own guide dogs should see "Guide Dogs for the Blind or Disabled" below. Cruising with a disability. See http://www.cruisecritic.com/articles.cfm?ID=9. Holland America Facilities and Services for Guests with Disabilities, see http://www.hollandamerica.com/assets/news/SpecialNeedsTravel_FactSheet.pdf. NCL Accessibility Assistance, see http://www.ncl.com/about/accessible-cruising. P&O Cruises Accessible Cabins, see http://www.cruise.co.uk/images/Cruise//cruise_gallery/1/PO_Accessible_Cabin_List_0.pdf. Princess Cruises Accessibility for disabled passengers, see http://www.princess.com/news/backgrounders_and_fact_sheets/factsheet/Princess-Access-Makes-Cruise-Vacations-Accessible-For-Passengers-With-Disabilities.html#.Ugi08btwZD8. Regent Seven Seas Cruises Accessibility. See http://www.specialneedsatsea.com/about-us/cruise-lines/regent-seven-seas-cruises/. Royal Caribbean Disabled Acessibility Cruises, see http://www.royalcaribbean.co.uk/why-cruise/accessibility/. Bermudians only, who pass a very strict means test and have no income, have no home of their own, no or purely nominal savings or investments, can get Financial Assistance. Contact the Bermuda Government's Ageing and Disability Services Office. Open 8:45 am to 5 pm Monday-Friday. Phone (441) 292-7802. Fax (441) 292-7681. There is a "Special Persons" photo-ID for locals, available to both the under 65s who are registered as disabled confirmed by a registered medical doctor, and senior citizens over 65s. They do not include the word "disabled" (recommended by this author, to enable them if they go overseas, to apply for disabled "Concessionary Travel" discounts). For Senior Citizens/Disabled/Physically Handicapped who can use a bus, free passes are available to Local Residents only with a Special Persons Card. (Seniors or disabled/handicapped from abroad without such a card pay full price). Unlike in the UK, there are no similar concessionary fares for a companion, who may be younger, of someone elderly or disabled/physically handicapped. Registered disabled owners of cars, on application to the Transport Control Department (see below), may qualify for free annual licensing of one specific small private car if they can satisfy in writing all the following conditions: are the principal owner or co-owner of a qualifying vehicle; can drive themselves and have a valid license to do so and/or are actually in the vehicle themselves when it is being driven; are unable to ride on any buses because of medically acknowledged balance problems on them and are thus totally dependent on a private vehicle for transport. This is a Minister of Transport discretionary benefit, not a mandated one. 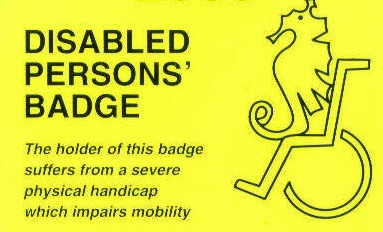 Disabled Persons Parking Badge. Like the part of one shown here below. Valid in Bermuda only - not in the UK or USA or Canada, etc. where different criteria apply to obtain such a badge. There is no equivalent in Bermuda of the USA's heavy fines, rigidly enforced by police as law enforcement officers when requested by disabled applicants, as penalties to scofflaws for parking illegally in a designated disabled parking space without an appropriate parking badge. There are some designated physically-handicapped parking areas for 4-wheeled vehicles (but not mobility scooters). When violations occur the police here won't act. Bermuda Islands Association for the Deaf (BIAD). P. O. Box HM 1749, Hamilton HM GX.. Registered charity. Bermuda Paralympic Association (BPARAS). Formed by Ann Lindroth, Vaughn Mosher, Leatrice Roman, Jennifer Southern, Paul Sullivan. RC 570. 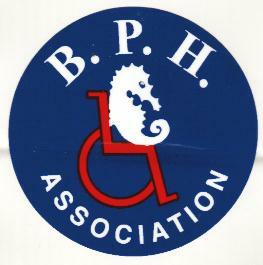 Bermuda Physically Handicapped Association (BPHA). Registered Charity No 088 under Bermuda's Charities Act 1978. Physical address: BPHA, Base Gate, 1 South Side, St. David's Island, DD 03, Bermuda. Postal (mailing) address: P.O. Box HM 8, Hamilton HM AX, Bermuda. Telephone (441) 293-5035, Monday to Friday 9:00 am to 5:00 pm local time. Or (441) 293-8148 after 5:00 pm. Or fax (441) 293-5036. The office is a small steel former Kindley military building. The only registered organization in Bermuda specifically for the physically challenged. Services include assisting in employment of the physically disabled and to promote better understanding and public awareness of their difficulties and needs. Members include blind or sight-impaired; deaf; speech-impaired and amputees. Anyone, disabled or not, is welcome to join. Visitors and any working newcomers who are helped in any way by the BPHA are urged to become members and take an active interest. Membership is a nominal cost per person but donations from individuals and companies are welcomed and encouraged. All members have a Membership Card and a large or small BPHA sticker for their vehicle or their caregiver's vehicle. Some permanently disabled Bermudians live at Summerhaven (shown below, right), the only residence in Bermuda for the permanently physically disabled, in Smith's Parish. There is a huge waiting list for it. It is run by the Summerhaven Trust, operated by an independent board. It receives a government grant to assist with its day-to-day operations. Other financial support comes from donations and a subsidy from the Bermuda Hospitals Board (BHB). Each of the residents at the facility are responsible for paying their rent for the studio apartments. They are also provided with two meals a day and 24-hour attendant care. Bermuda Riding for the Disabled Ltd. Equestrian Centre, Windreach Recreational Village. P. O. Box WK 525, Warwick WK BX. Bermuda Society for the Blind. Beacon House, 3 Beacon Rd, Hamilton HM 10. Phone 292 3231. Monday to Friday 10am-3pm. Established in 1957. Promotes visual health and empowers persons who are blind or vision impaired to achieve independence by providing Vision Rehabilitation Therapy. Advocates to increase awareness about living with vision loss and promotes visual health through public education and outreach. RC 090. Bermuda Special Needs Network. A new advocacy group formed in 2011 to help promote the concerns of the Island's special needs community. It wants to see an accurate census of the population of special needs residents here, raise awareness for some of its most pressing issues, and then ask Government to let the community know how these issues are being addressed. It’s an umbrella organization, rather than different groups working in isolation. Most of the special needs population is hidden. Bermuda Stroke & Family Support Association. Registered Charity. Committee of 25 for Handicapped Children. P. O. Box HM 927, Hamilton HM DX. Registered charity. Tae Durham Charitable Association for Physically Handicapped Children. Windreach Recreational Village. Registered Charity. P. O. Box WK 464. Warwick, WK BX. Telephone 238 2469 or fax 238 2597. Contact the Bermuda Government's Ageing and Disability Services Office. Open 8:45 am to 5 pm Monday-Friday. Phone (441) 292-7802. Fax (441) 292-7681. Then refer to one issued by the Corporation of Hamilton. It has many such parking spaces. Another version is issued by the Corporation of St. George. It has one Disabled Persons Parking Badge Permit parking space. To be eligible, persons must have signed written verification from a doctor that the person has a severe physical disability that severely impairs mobility. If under 65 years old, they must also get - at a nominal cost of $1 - a Special Persons ID cards. Persons/caregivers should never park in a Handicapped Parking by Permit Only or Handicapped Parking area until they have actually received and affixed their Permits to their vehicles. To be valid, Disabled Persons Badges must be renewed by 31 January each year, with the previous year's Badge surrendered to the Corporation of Hamilton. Overseas, it is a very serious offence to park illegally - without a Permit - in a Handicapped Parking by Permit Only and Handicapped Parking area. Doing so illegally carries penalties galore. A DPPB of this type is unique to Bermuda. It must be emphasized that it is NOT valid in the UK or USA or Canada, (where different criteria apply to qualify to obtain one, including that a disability must be of a permanent type recognized by a relevant disability authority , the application must be supported by the applicant getting a Disability Living Allowance or USA or Canadian or European equivalent - and the application must be approved by a competent local authority). Local qualifiers going overseas should check with the Corporation of Hamilton. There is no requirement for Bermuda to honor any disabled parking permits from any country, unlike in Canada, USA, UK and Europe where there are reciprocal agreements to honor those from certain named countries (which exclude Bermuda). Specially-marked parking for the disabled is available at the areas shown below, for those with a valid Disabled Person's Parking Badge/Permit (or overseas legally accepted equivalent which they should bring with them if portable). While many places have "Handicapped Parking" signs, so far only the City of Hamilton, Bermuda International Airport and Southampton Princess Hotel have "Handicapped Parking by Permit only" signs. King Edward VII Memorial Hospital (KEMH) and other Bermuda Government owned facilities such as the Bermuda International Airport and Bermuda Aquarium are not private parking areas but public ones coming under the Parking of Vehicles (Designated Areas) Act 1973. Bermuda Aquarium, Museum & Zoo. 1. Bermuda International Airport, 2. Outside Arrivals. Bermuda National Library, 1. Queen Street, Hamilton. Provided by Corporation of Hamilton. City Hall, 2, behind, for one-to two hours only. Provided by Corporation of Hamilton. City of Hamilton, 8, public car parks. Provided by Corporation of Hamilton. Fairmont Princess Hotel, Southampton, 2. Reid Street, Hamilton. Outside Marks & Spencer. 1.Provided by Corporation of Hamilton. Town of St. George, 1. How Bermuda compares with USA, Canada, UK, Europe, etc. If you are reading this file from beyond Bermuda, please note that this file deals only with facilities and services in Bermuda, not overseas. We do not show any resources beyond Bermuda because most, if not all, do not apply in Bermuda which is not in the UK or USA and has its own laws. Disability or physically challenged-related websites from those countries often advertise they offer free or low-cost services. But they invariably apply in their own countries only. If Bermuda residents qualify to order them and their locally issued credit cards are accepted by suppliers they will have to bear the cost of shipping or air freight and pay Bermuda Customs import duty. No restaurant in Bermuda offers all the following - disabled entrance parking, disabled exterior, disabled interior and disabled toilet. Only one (Pink Cafe) has a toilet for the disabled. None of the restaurants have the disability standards of the USA, UK, Europe, Australia, New Zealand, etc. A major historic and cultural attraction in the Town of St. George. Disabled and mobility-impaired visitors in a wheelchair should enter the church from the back for much easier access as they will not be able to mount the steep wide staircase from the street. 57 Spice Hill Rd., Warwick West WK 03 or P.O. Box WK 654, Warwick West WK BX. A horse-riding resource for the disabled. Telephone (441) 238-2469.